is terminated by the APC-driven degradation complex. This leads to the signal messenger β-catenin being degraded by the proteosome. Other examples of growth factor signaling that is terminated by a proteosome-directed include the Hedgehog signaling system, which is involved in growth and differentiation as well as WNTs and is implicated in various cancers. Cancer is expressed through a series of transformations equally involving metabolic enzymes and glucose, fat, and protein metabolism, and gene transcription, as a result of altered gene regulatory and transcription pathways, and also as a result of changes in cell-cell interactions. These are embodied in the following series of graphics. The figure shows a modification of nuclear translocation by Sonic hedgehog pathway. The hedgehog proteins have since been implicated in the development of internal organs, midline neurological structures, and the hematopoietic system in humans. 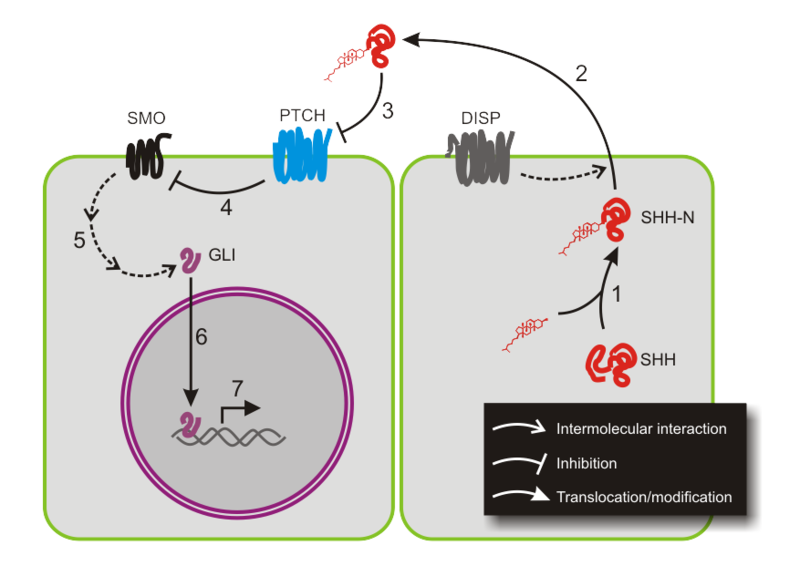 The Hh signaling pathway consists of three main components: the receptor patched 1 (PTCH1), the seven transmembrane G-protein coupled receptor smoothened (SMO), and the intracellular glioma-associated oncogene homolog (GLI) family of transcription factors.5The GLI family is composed of three members, including GLI1 (gene activating), GLI2 (gene activating and repressive), and GLI3 (gene repressive).6 In the absence of an activating signal from either Shh, Ihh or Dhh, PTCH1 exerts an inhibitory effect on the signal transducer SMO, preventing any downstream signaling from occurring.7 When Hh ligands bind and activate PTCH1, the inhibition on SMO is released, allowing the translocation of SMO into the cytoplasm and its subsequent activation of the GLI family of transcription factors. And from the review of Elaine Y. C. Hsia, Yirui Gui, and Xiaoyan Zheng Regulation of Hedgehog Signaling by Ubiquitination Front Biol (Beijing). 2015 Jun; 10(3): 203–220. Finally, termination of Hh signaling is also important for controlling the duration of pathway activity. Hh induced ubiquitination and degradation of Ci/Gli is the most well-established mechanism for limiting signal duration, and inhibiting this process can lead to cell patterning disruption and excessive cell proliferation (Di Marcotullio et al. 2006; Huntzicker et al. 2006; Kent et al. 2006; Zhang et al. 2006a; Di Marcotullio et al. 2007; Ou et al. 2007). In addition to Ci/Gli, a growing body of evidence suggests that ubiquitination also plays critical roles in regulating other Hh signaling components including Ptc, Smo, and Sufu. Thus, ubiquitination serves as a general mechanism in the dynamic regulation of the Hh pathway. Note that in absence of Hedgehog ligands Ptch inhibits Smo accumulation and activation but upon binding of Hedgehog ligands (by an autocrine or paracrine fashion) Ptch is now unable to inhibit Smo (evidence exists that Ptch is now targeted for degradation) and Smo can now inhibit Sufu-dependent and GSK-3B dependent induced degradation of Gli factors Gli1 and Gli2. Also note the Gli1 and Gli2 are transcriptional activators while Gli3 is a transcriptional repressor.